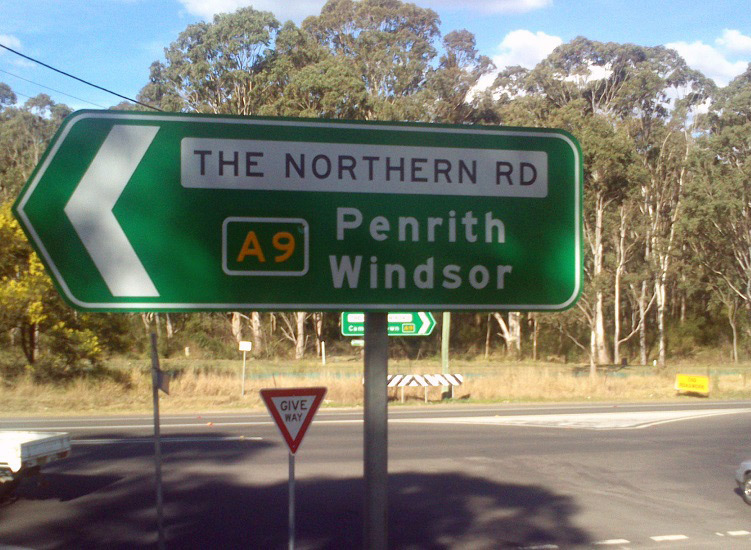 RD sign northbound on The Northern Road after the junction with the Western Motorway, South Penrith. Source: Andrew Ison, August 2013. 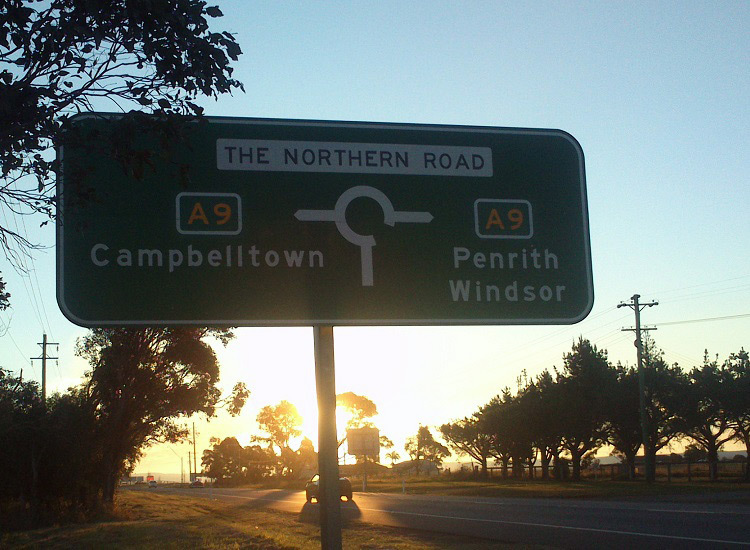 Route A9 is the western-most circumferential route in Sydney, providing a north-south link between Campbelltown, Camden, Penrith and Windsor. It directly replaces the former Metroad 9. The then RTA undertook a large number of sign replacements along this route in 2004 in preparation for the alpha-numeric rollout. As a result, this route is entirely signed with alpha-ready signage, rather than coverplates or topknots. 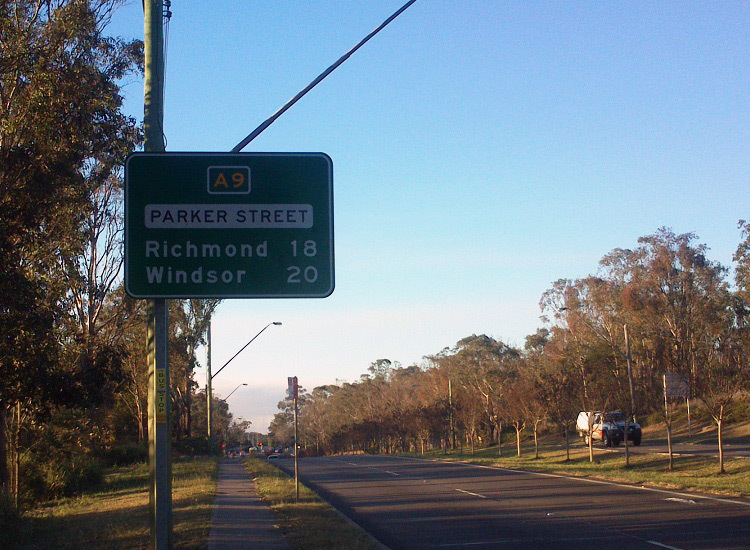 The first exposed A9 route marker was spotted in August 2007 as part of he construction of the Windsor Flood Evacuation Route (Hawkesbury Valley Way). These were then promptly coverplated with Metroad 9 shields. 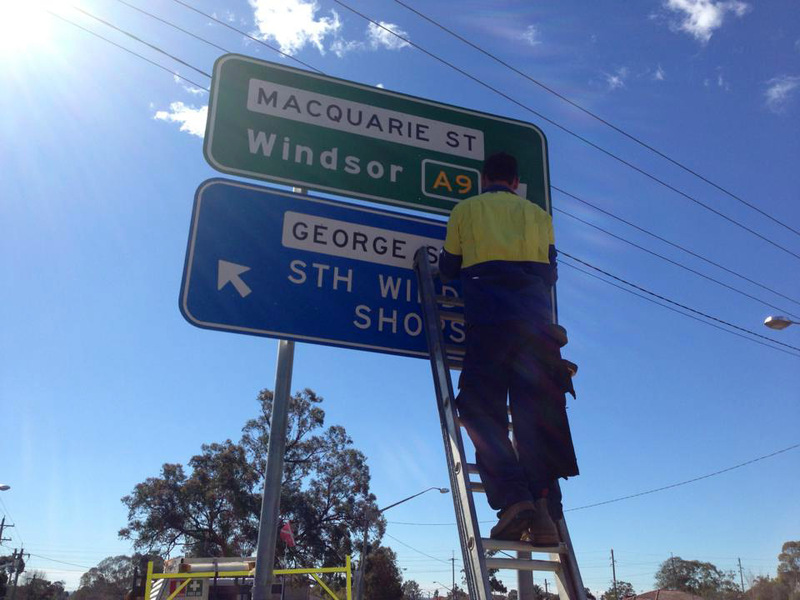 The 'coverplate fairies' uncovering the A9 route marker at the junction of Macquarie Street & George Street, South Windsor. Source: Michael Mak, August 2013. 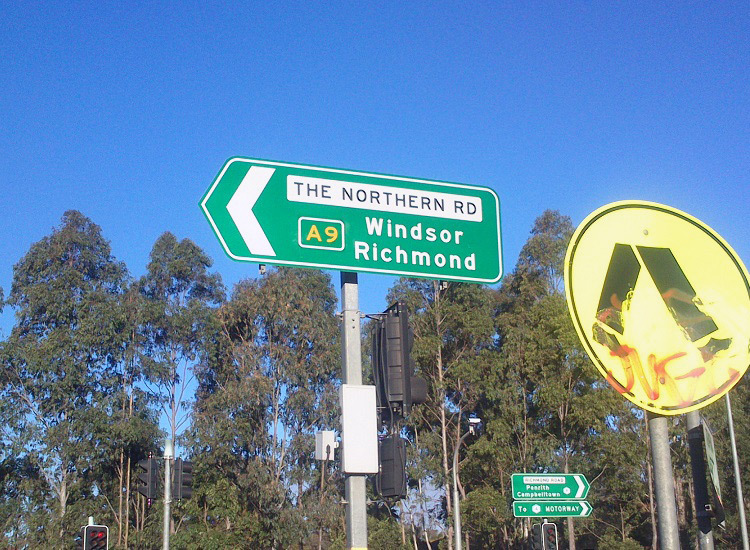 Prematurely uncovered A9 route marker on an ID sign at the junction of Hawkesbury Valley Way & Macquarie Street, Windsor. Prematurely uncovered A9 route marker on an ID sign at the junction of The Northern Road, Cranebrook Road & Londonderry Road, Llandilo. Source: Paul Mech, July 2010. RD sign southbound on The Northern Road after the junction with Londonderry Road & Cranebrook Road, Llandilo. Source: Andrew Ison, August 2013. 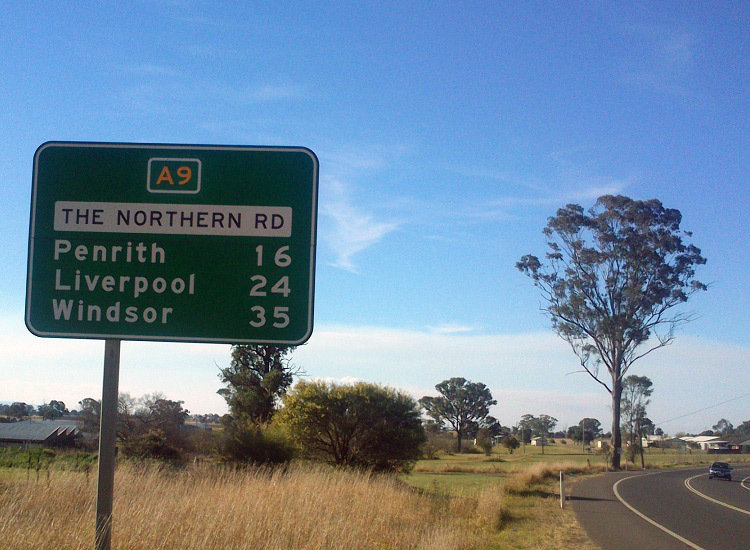 AD sign eastbound on Andrews Road approaching the junction with The Northern Road & Richmond Road, Cranebrook. 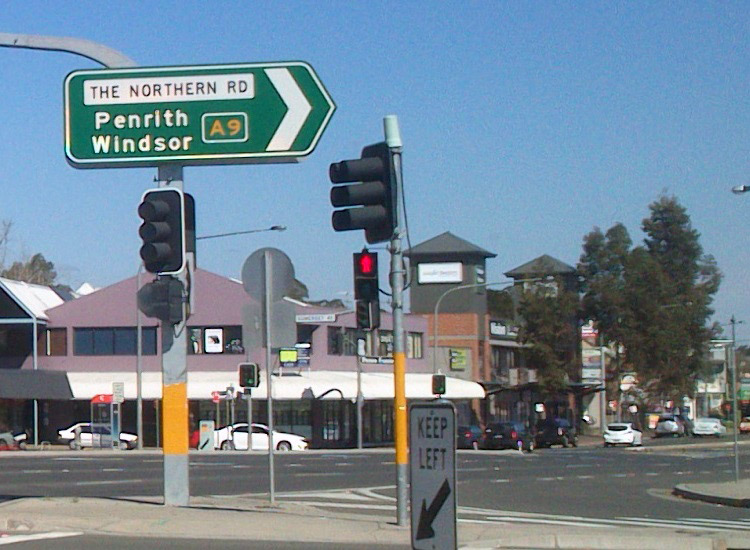 For some strange reason, The Northern Road becomes Richmond Road, then Parker Street, then The Northern Road again as it passes through Penrith. 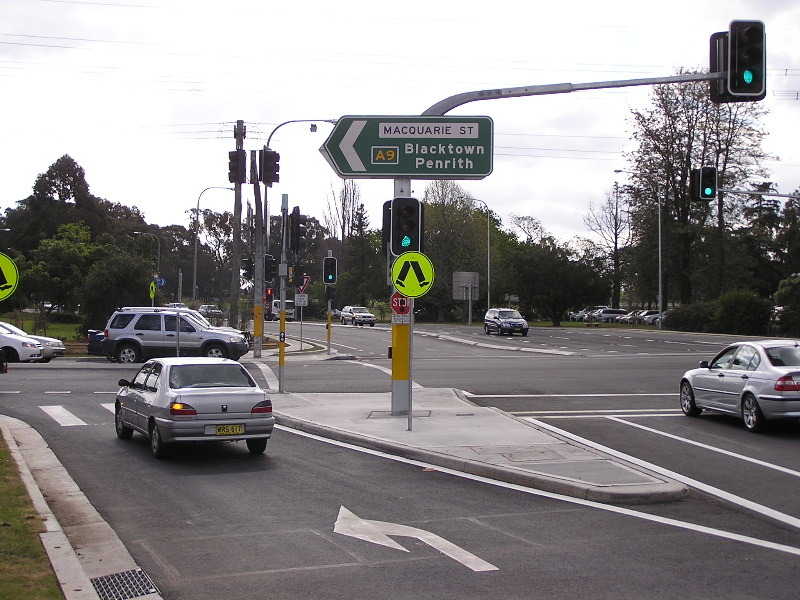 ID signs at the junction of The Northern Road, Richmond Road & Andrews Road, Cranebrook. Note the Metroad 4 & 9 coverplates still adorning the right-pointing signs. AD sign southbound on Richmond Road approaching the junction with Dunheved Road, Cambridge Park. 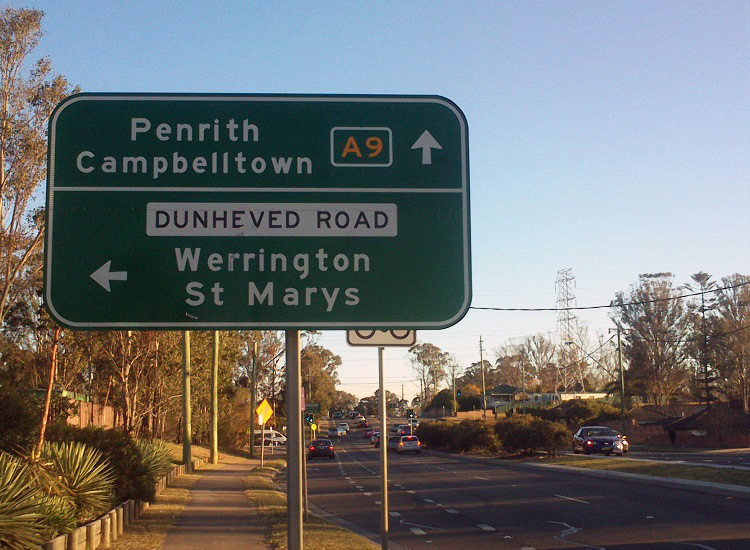 RD sign northbound on Parker Street after the junction with Glebe Place, Penrith. 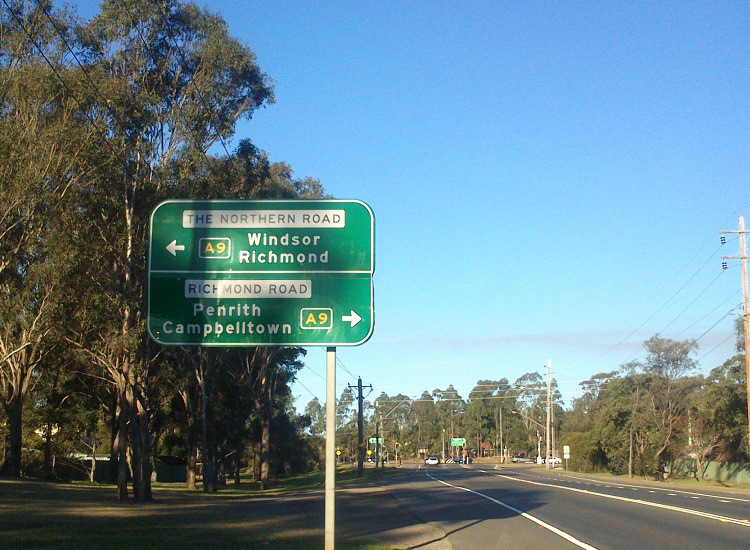 RD sign southbound on Parker Street after the junction with Great Western Highway, Kingswood. 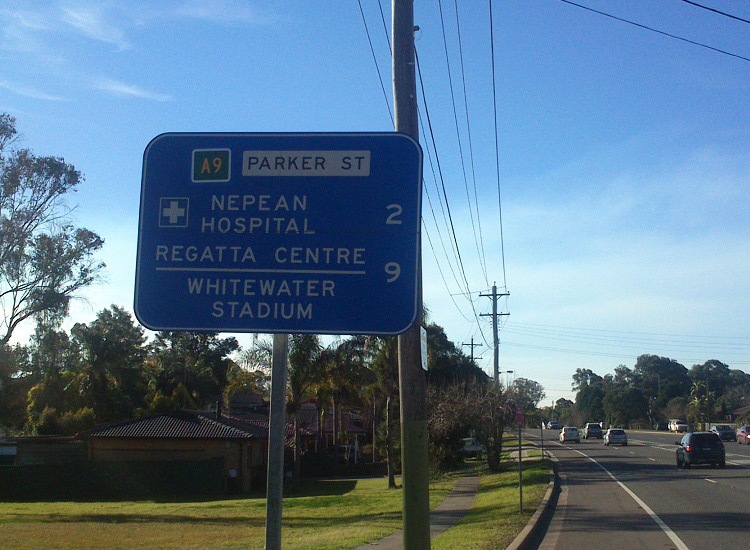 Supplementary service RD sign northbound on Parker Street after the junction with Bringelly Road & Maxwell Street, South Penrith. 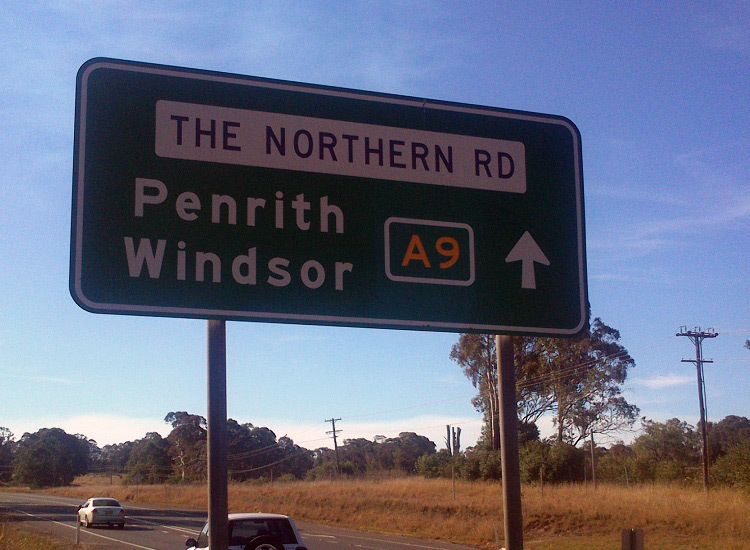 RD sign northbound on The Northern Road after the junction with the Western Motorway, South Penrith. 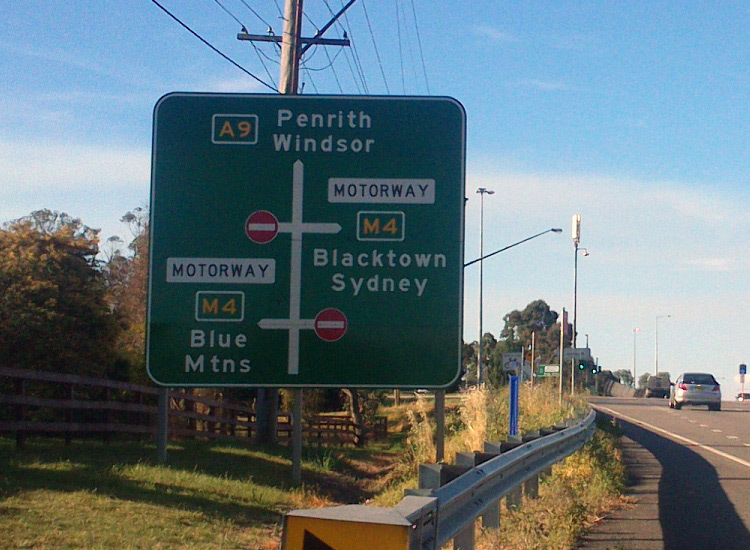 Diagrammatic AD sign northbound on The Northern Road approaching the junction with the Western Motorway, Orchard Hills. 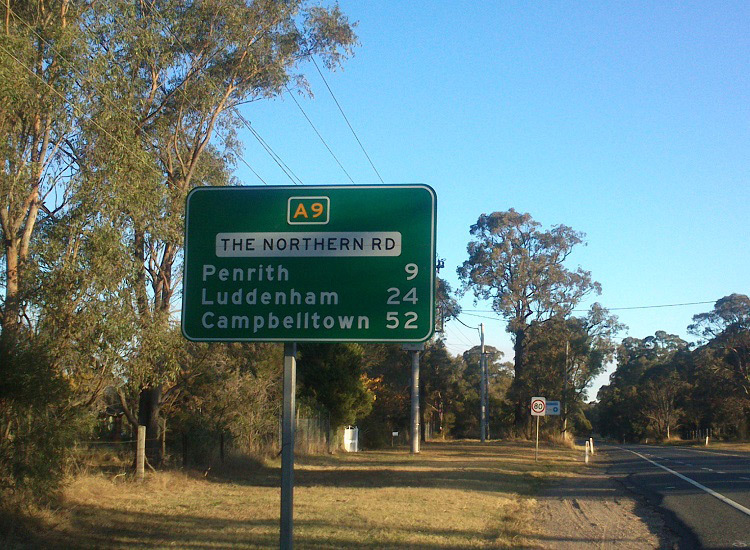 RD sign northbound on The Northern Road after the junction with Park Road, Luddenham. 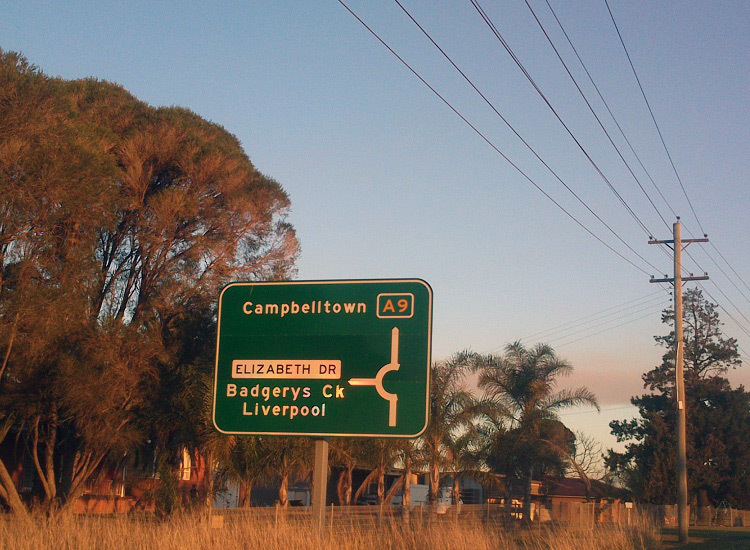 Diagrammatic AD sign southbound on The Northern Road approaching the junction with Elizabeth Drive, Luddenham. Diagrammatic AD sign westbound on Elizabeth Drive approaching the junction with The Northern Road, Luddenham. 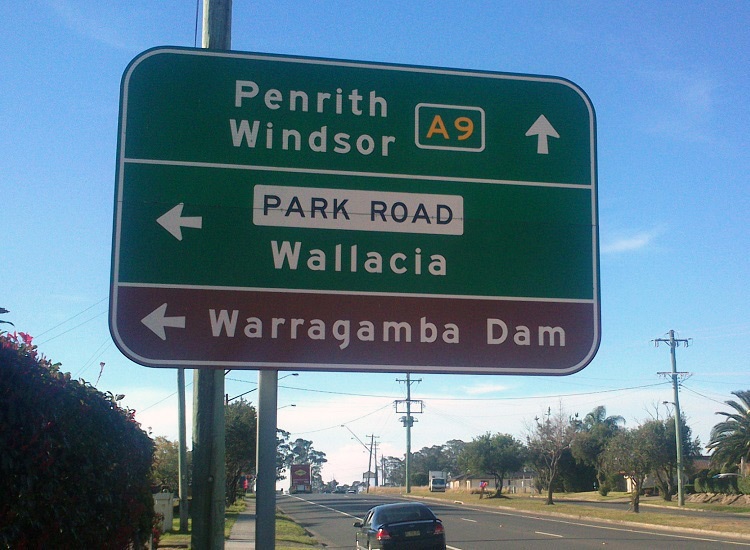 Note the omission of Wallacia as a focal point for the left turn despite it being the focal point on Elizabeth Drive signage since Liverpool. 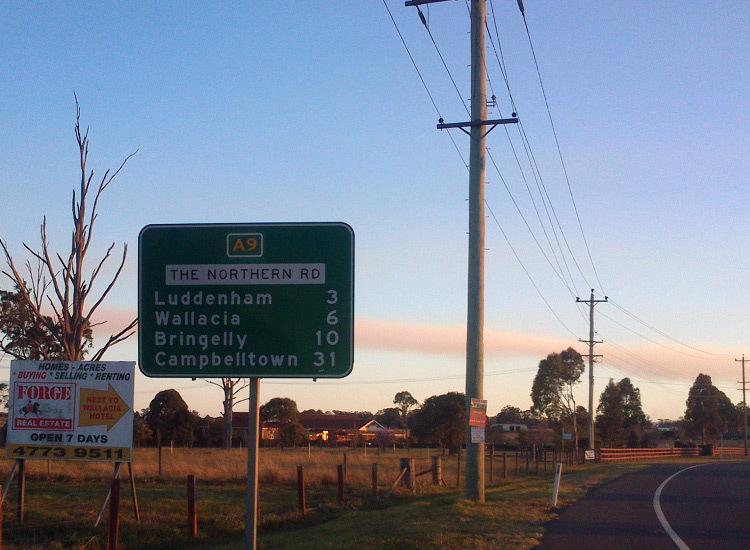 RD sign southbound on The Northern Road after the junction with Elizabeth Drive, Luddenham. AD sign northbound on The Northern Road approaching the junction with Park Road, Luddenham. 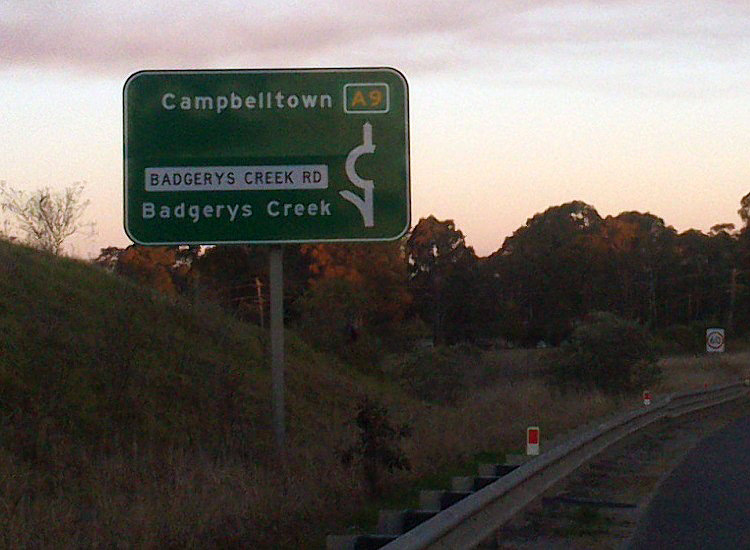 Diagrammatic AD sign southbound on The Northern Road approaching the junction with Badgerys Creek Road, Bringelly. 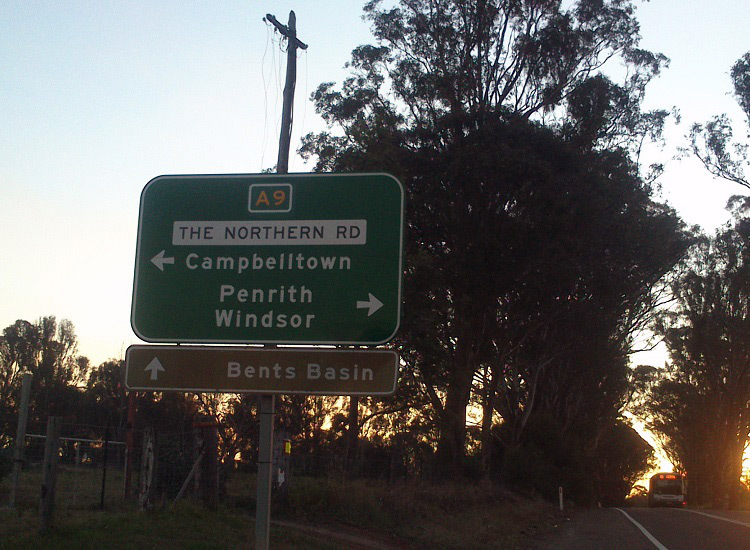 ID sign facing northbound traffic at the junction of The Northern Road & Badgerys Creek Road, Badgerys Creek. 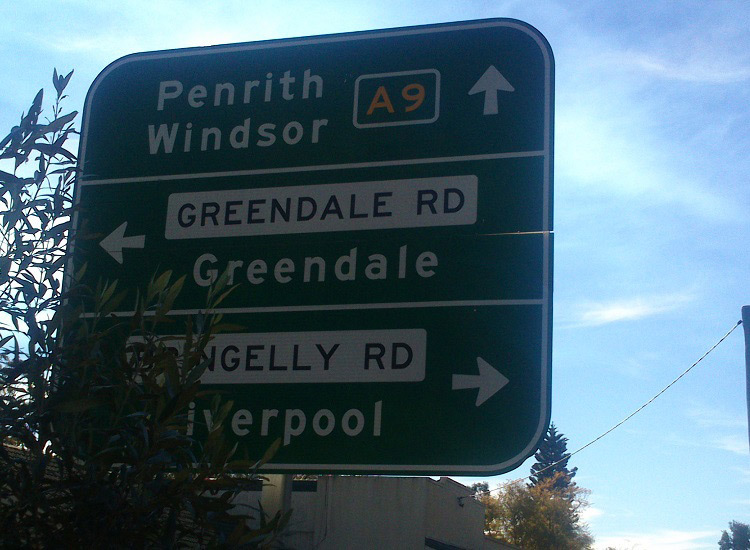 AD sign westbound on Bringelly Road approaching the junction with The Northern Road & Greendale Road, Bringelly. 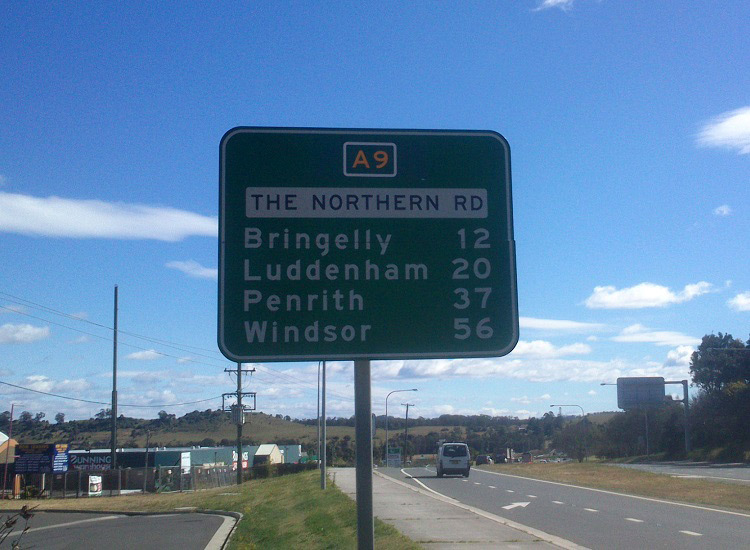 AD sign northbound on The Northern Road approaching the junction with Bringelly Road & Greendale Road, Bringelly. 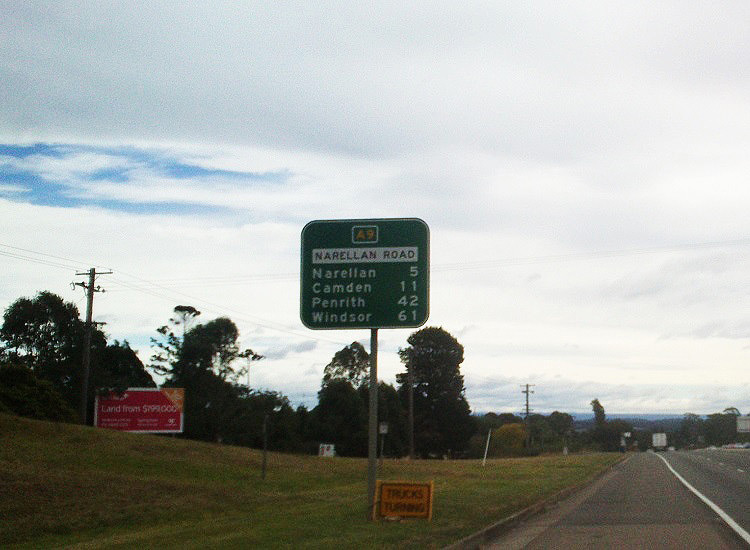 RD sign southbound on The Northern Road after the junction with Bringelly Road & Greendale Road, Bringelly. 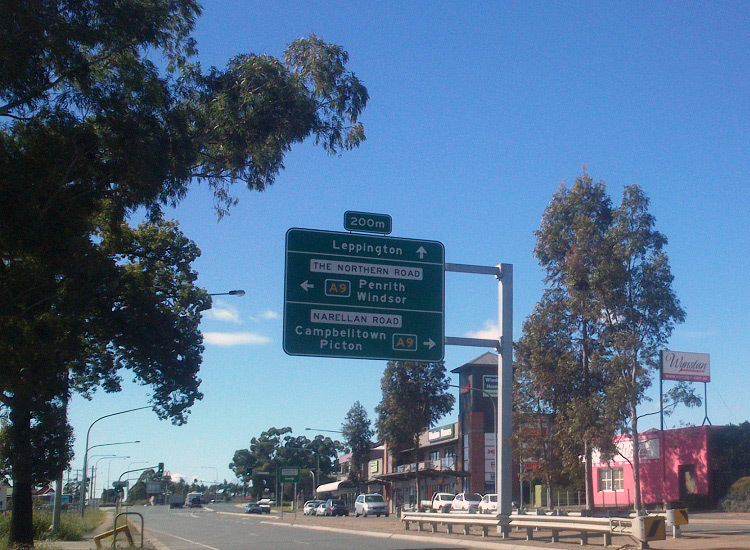 ID sign facing westbound traffic at the junction of The Northern Road & Cobbitty Road, Oran Park. 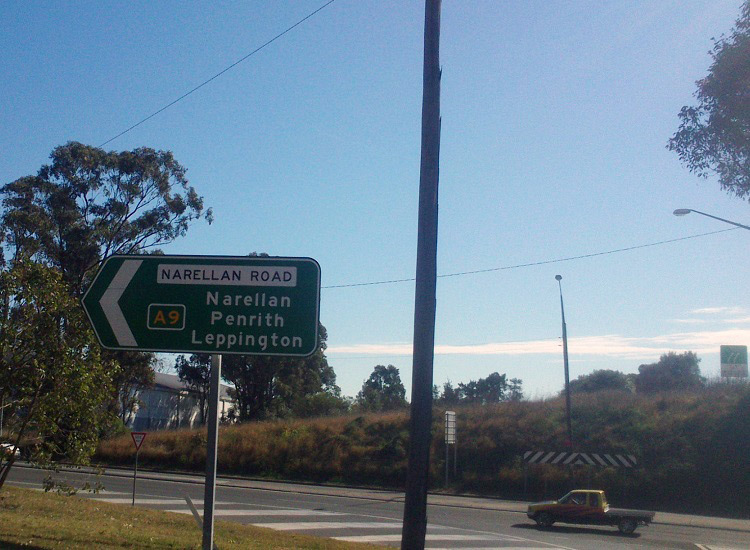 RD sign northbound on The Northern Road after the junction with The Old Northern Road, Narellan. 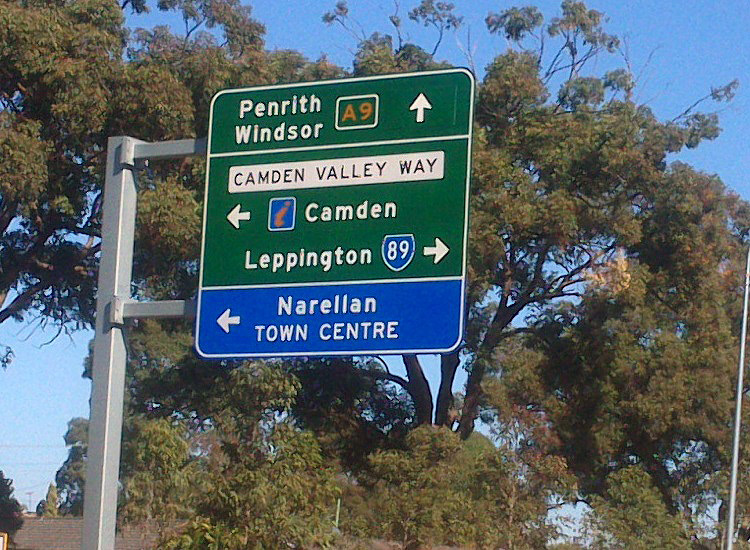 AD sign south eastbound on The Northern Road approaching the junction with Camden Valley Way & Narellan Road, Narellan. 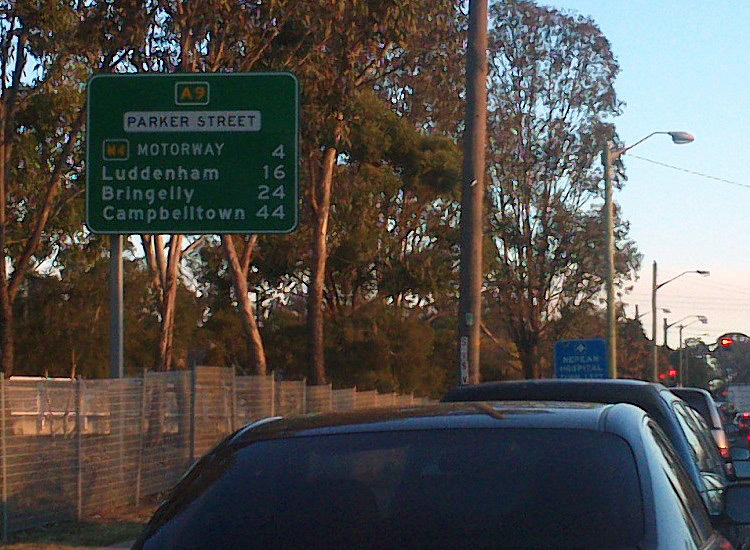 ID sign facing northbound traffic at the junction of Camden Valley Way, Narellan Road & The Northern Road, Narellan. 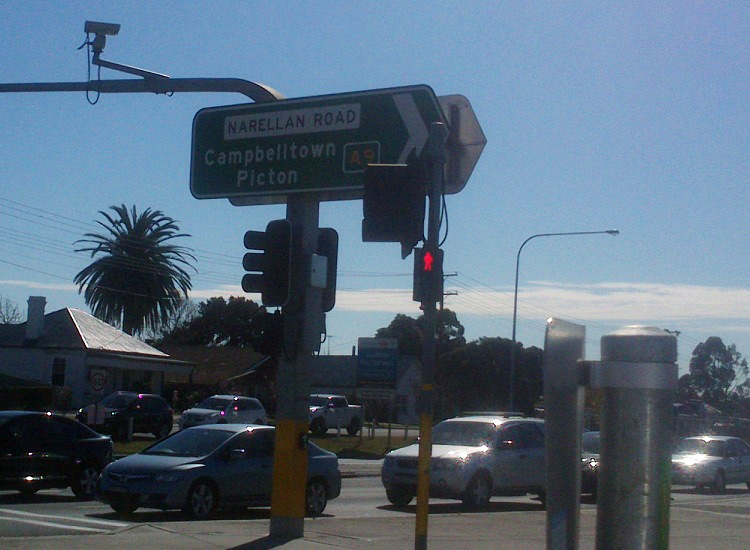 ID sign facing southbound traffic at the junction of Camden Valley Way, Narellan Road & The Northern Road, Narellan. 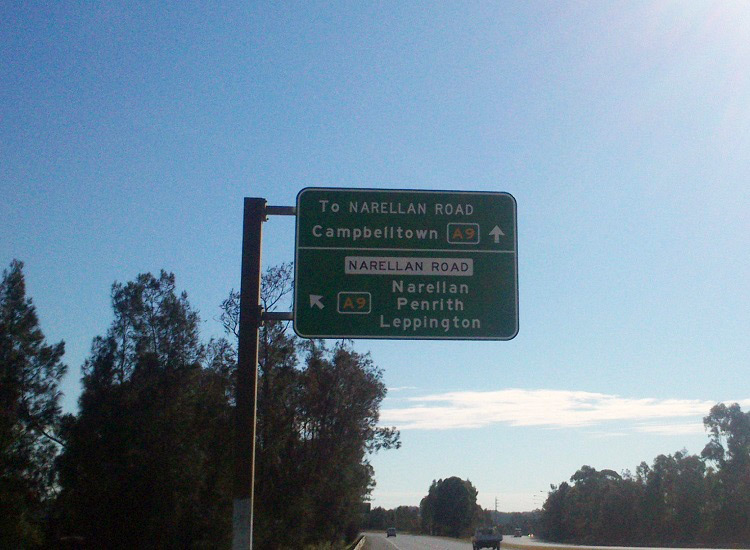 AD sign northbound on Camden Valley Way approaching the junction with Narellan Road & The Northern Road, Narellan. 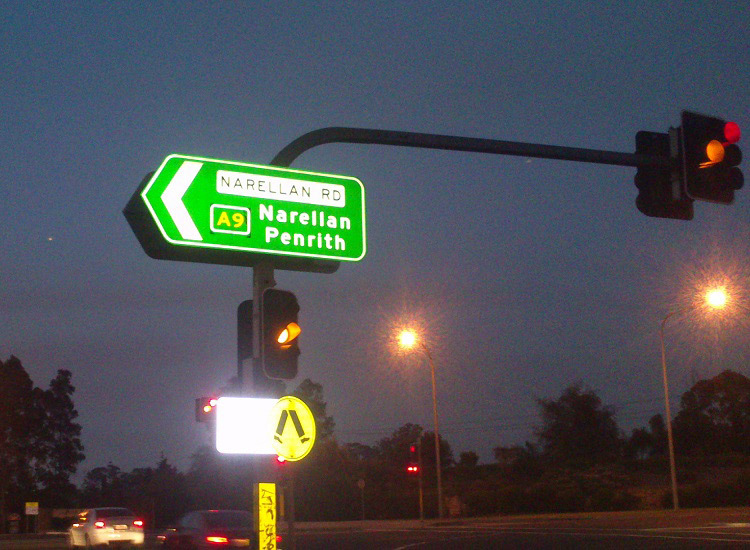 AD sign north westbound on Narellan Road approaching the junction with Camden Valley Way & The Northern Road, Narellan. Note the remnant State Route 89 shield which has not yet been covered. 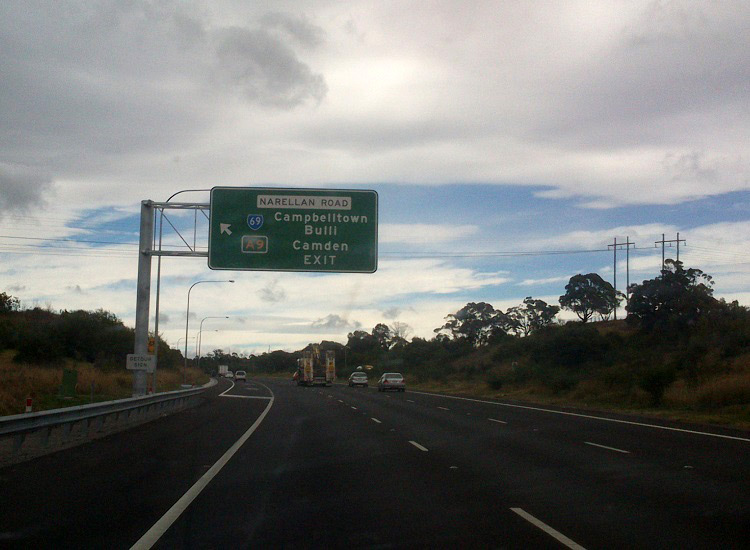 AD sign eastbound on Narellan Road approaching the junction with Camden Bypass, Narellan. 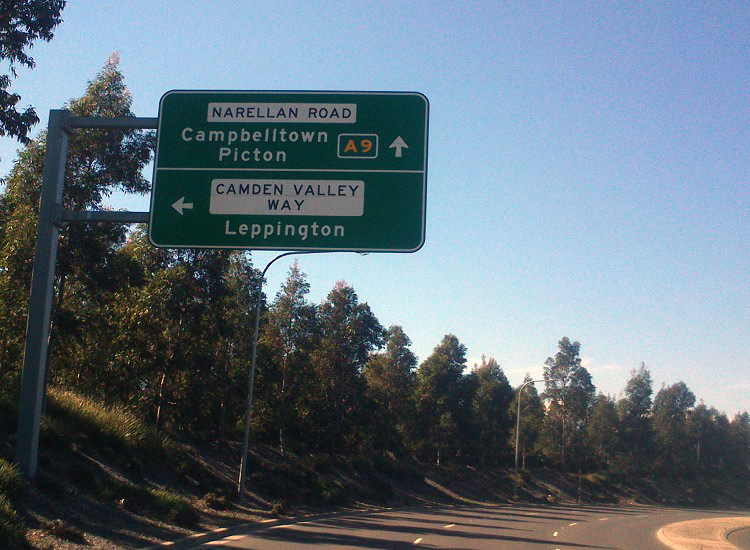 AD sign northbound on Camden Bypass approaching the junction with Narellan Road, Narellan. 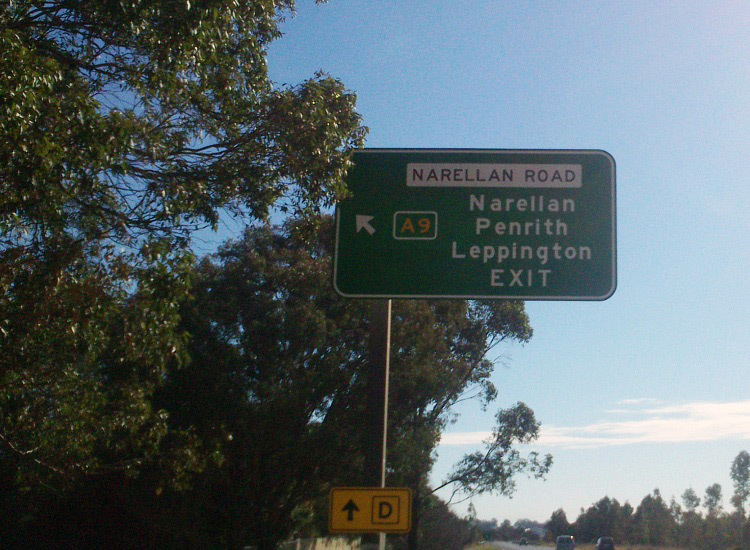 Northbound Exit Direction sign on Camden Bypass approaching the junction with Narellan Road, Narellan. 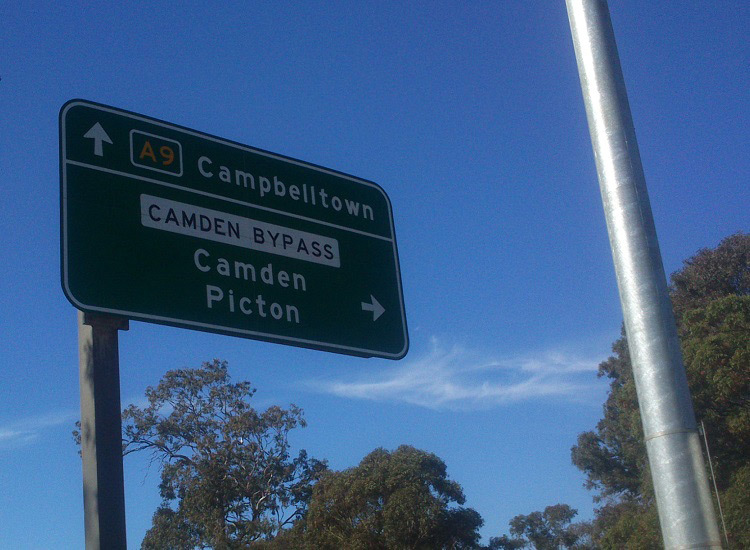 ID sign facing northbound traffic from the Camden Bypass off-ramp at Narellan Road, Narellan. ID sign facing northbound traffic at the junction of Narellan Road, Mt Annan Drive & Tramway Drive, Mt Annan. 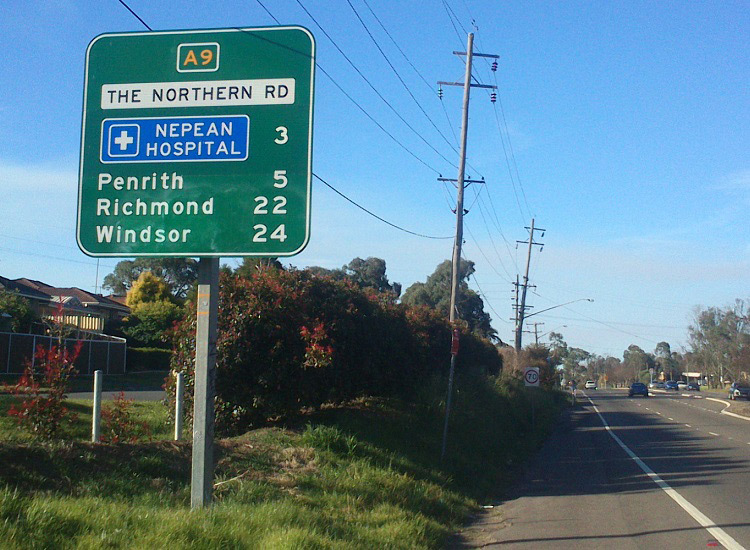 RD sign north westbound on Narellan Road after the junction with Hume Motorway, Mount Annan. 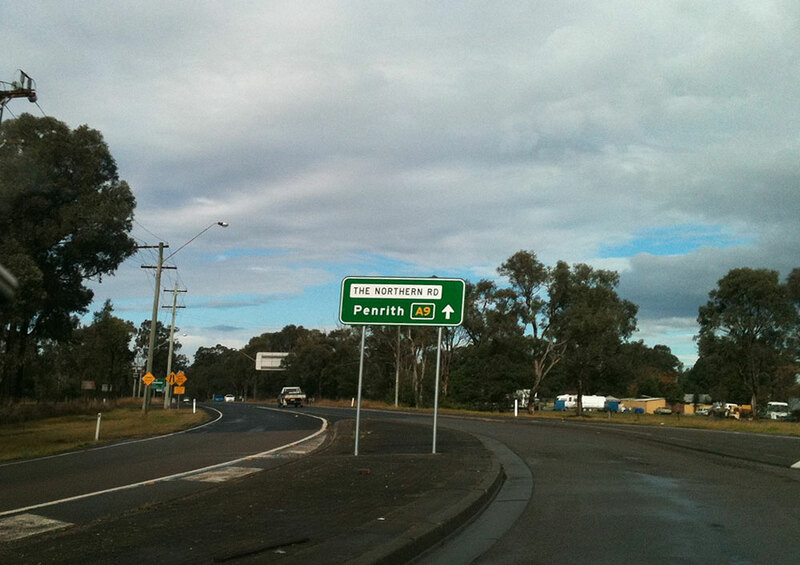 Supplementary tourist AD sign southbound on Hume Motorway approaching the junction with Narellan Road, Campbelltown. 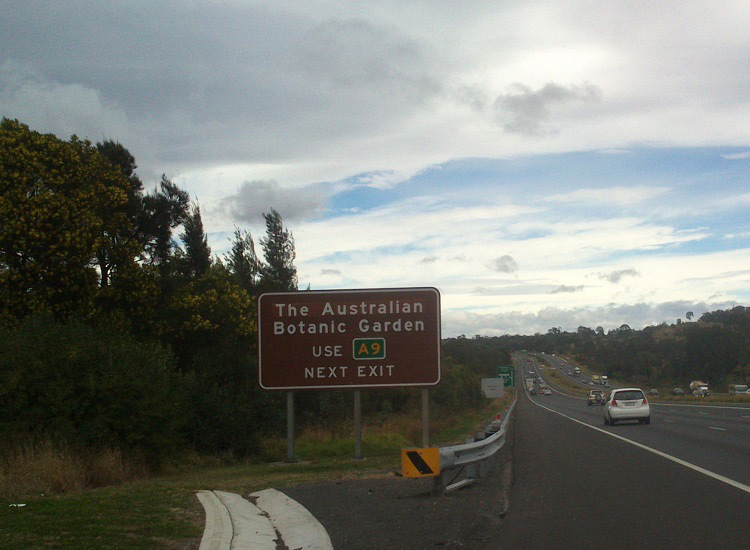 The Australian Botanic Garden was formerly known as Mt Annan Botanic Garden. 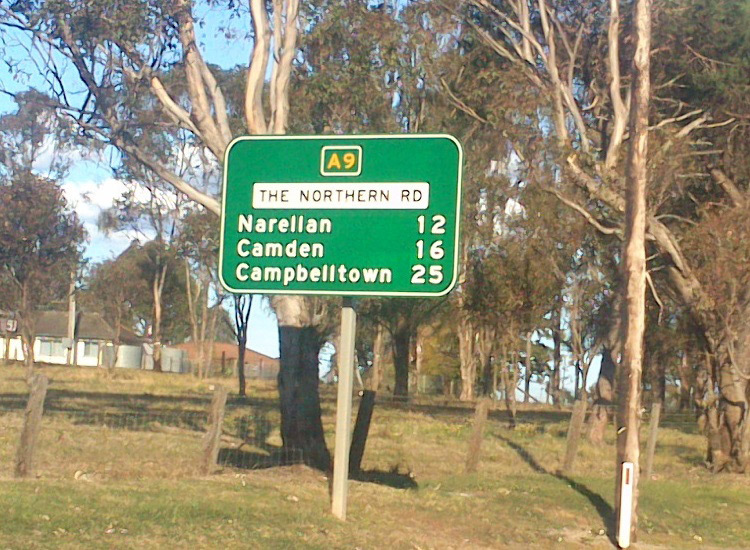 Southbound Exit Direction sign on Hume Motorway at the Narellan Road exit, Campbelltown, showing A9 uncovered but B69 still covered.